Granted we have entered the summer months but the heatwave is not expected to hit the Capital until next month. We are in the region of 20 to 28 degrees Celsius right now, peppered with the occasional shower here and there. So the climate in the office now is not warm albeit very stuffy. It is one of those awkward situations where turning on the air-conditioner is a tad overkill but yet you can't really function in a room of still air. 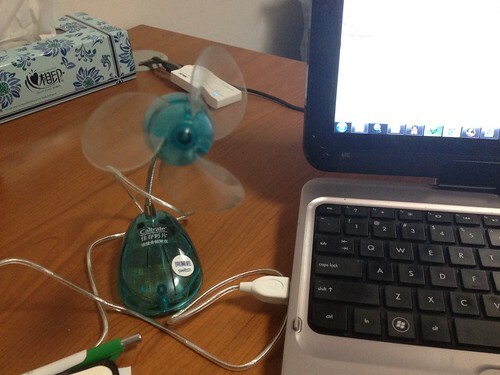 A friend of mine gave me this freebie USB table fan a while ago. This is the perfect time to put it to use. Although it is a tiny fan but having it blow right at you makes working in the office alright again.